Does Mnangagwa Accept That Women Should Not Lead? To say that I was shocked to read in the media that Zimbabwe president Emmerson Dambudzo Mnangagwa – during his recent visit to the Johannes Marange Apostolic sect – accepted their declaration that women should not lead, would be a grave understatement, but, rather I was dumbfounded – as such is not to be expected of a leader of a modern society in the 21st century. 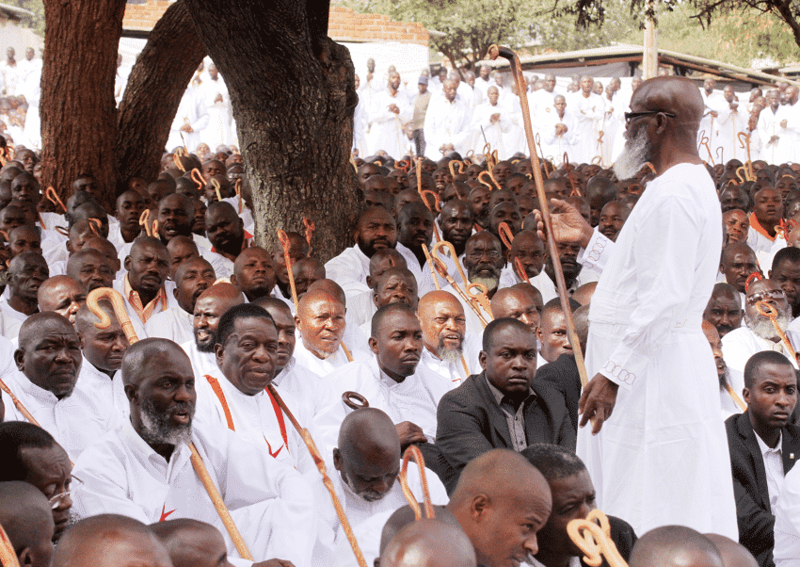 This worrisome declaration by the Johanne Masowe Apostolic sect came in the wake of their blasphemous proclamation that Mnangagwa had been anointed by Jehovah God to win the forthcoming elections, and that if he was to stay in power, he should never allow a woman to take the reins. One would have expected Mnangagwa – as both the current leader of a modern civilized society, and a presidential candidate in the 30 July 2018 harmonized elections – to have taken a stand against such a brazen attack on women, but sadly, he failed to do so, resorting, instead, to thanking the apostolic sect. As much as this sect’s declaration was made following the claim that then Zimbabwe president Robert Gabriel Mugabe lost his ‘anointing’ due to his surrendering his ‘powers’ to his wife Grace, Mnangagwa should have been quick to point out that this was not a gender issue, but a case of a misguided first lady. Actually, the fact that the apostolic sect even warned Mnangagwa ‘not to involve a woman in his reign’, confirms that this had everything to do with gender discrimination than anything else. The sect’s proclamations are neither in tandem with modern society, or the Holy Bible, as even Jesus Christ himself involved women in his ministry – a case in point being Mary of Magdalena. Therefore, for Mnangagwa to simply thank the apostolic sect for their ‘anointing’ and proclamations, without so much as correcting them on their brazenly sexist and primitive stance, speaks volumes about the president. Is that why his ZANU PF party never bothered to address its women’s league concerns that they were short-changed during their primary elections? I remember watching a press conference on Friday between the British prime minister Theresa May and US president Donald J. Trump, in which the former tried all her best to remain as diplomatic as possible amid controversial policies and statements by the latter, especially in the Sun newspaper a day before. However, when Trump reiterated his opposition to immigration and multi-cultural societies, May immediately broke ranks with him, and threw diplomacy aside, by making it unequivocally clear how immigration had benefited Britain. Did he fear that the ‘anointing’ placed on him would be revoked? If so, then the ‘anointing’ would clearly not have been from the Jehovah God that I know and worship – as His anointing can never be withdrawn by anyone except himself. Genuine prophets of God are mere messengers, and can not change anything that Jehovah would have established. The fact that he did not, may possibly show that, deep down, he does not believe that this anointing was truly from God, but it was from these ‘prophets’ own dubious powers, which they can revoke anytime they please. As Zimbabweans are left with only two weeks to the watershed harmonized elections, this is an opportunity for those, especially women – who were about to make the gravest mistake of their lives by believing that Mnangagwa was on their side – to correct their perceptions. Zimbabweans, especially women need to be very careful as they go into the ballot box on 30 July, as one misplaced ‘X’ can cancel out any hope for gender parity. Tendai Ruben Mbofana is a social justice activist, writer, author, and speaker. He is the Programmes Director with the Zimbabwe Network for Social Justice (ZimJustice). He can be contacted on email: zimjustice@gmail.com. Please also ‘Like’ the ‘ZimJustice’ page on Facebook.